Kate Yoshida, Jose Hernandez (pictured), John Coronado, and Rob Dixon accept the award on behalf of the university. 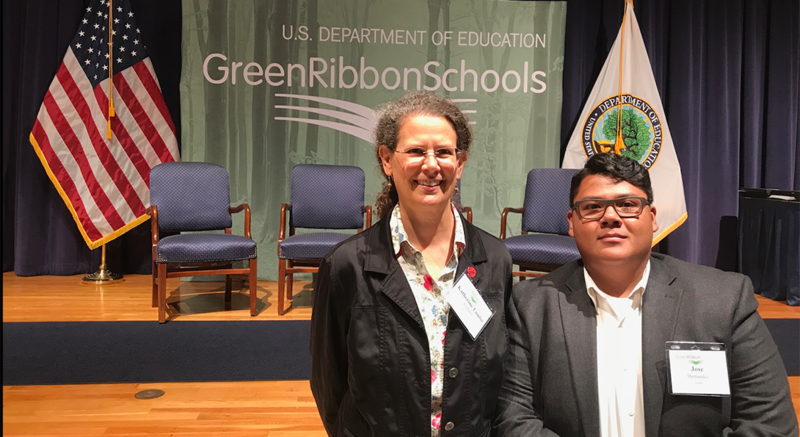 Washington, D.C., September 19, 2018 - National Oceanic and Atmospheric Administration Education Director Louisa Koch, Director of the Campaign for Environmental Literacy James L. Elder, and Director of the Center for Green Schools at the U.S. Green Building Council Anisa Heming joined Assistant Secretary for Elementary and Secondary Education Frank Brogan today to congratulate University of Illinois at Chicago on their achievements at a ceremony at the U.S. Department of Commerce in Washington, D.C.
University of Illinois at Chicago was nominated by the Illinois Green Alliance. UIC’s environmental accomplishments include reducing energy use by 26% since 2008, having a commuter mode split for single-occupant driving of 40% (less than Chicago’s 51%), having an aggressive plan for stormwater diversion (from sewer system), and a waste diversion rate of 45%. In the areas of Health and Wellness, UIC offers numerous opportunities including its Environmental Health and Safety Office to promote a safe working and learning environment, open green spaces, participation in the Chicago bike share program, educational food gardens, and campus recreation centers. With regarding to education itself, there are co-curricular programs including the Sustainability Internship and Heritage Garden Internship, as well as the Institute for Environmental Science, UIC Energy Initiative, and the Institute for Humanities that conduct educational programs and research in the areas of energy, climate, and sustainability. There is a minor in Sustainability Cities offered through the College of Urban Planning and Policy that is open to all UIC undergraduates. “As UIC rises in the academic rankings, we are proud that to also receive recognition as a leader in sustainability.” Associate chancellor for sustainability, Cynthia Klein-Banai acknowledged the support of faculty, staff and students “This is not singularly the work of the Office of Sustainability, this is work that has to be done across the campus and I think the breadth of what they were looking for, what we’re being recognized for, shows that occasion from hundreds of people across campus toward creating a more sustainable, just world,” she said. View the list of all selected schools and districts and summaries of each of the 58 honorees. More information on the federal recognition award can be found here. Resources for all schools to meet the criteria for the award can be found here.